A wiki (Àtụ:Pron-en Àtụ:Respell) is a website that allows the easy creation and editing of any number of interlinked web pages via a web browser using a simplified markup language or a WYSIWYG text editor. Wikis are typically powered by wiki software and are often used to create collaborative websites, to power community websites, for personal note taking, in corporate intranets, and in knowledge management systems. Wikis may exist to serve a specific purpose, and in such cases, users use their editorial rights to remove material that is considered "off topic". Such is the case of the collaborative encyclopedia Wikipedia. In contrast, open purpose wikis accept content without firm rules as to how the content should be organized. Ward Cunningham, the developer of the first wiki software, WikiWikiWeb, originally described it as "the simplest online database that could possibly work." "Wiki" (Àtụ:Pron or Àtụ:IPA-all) is a Hawaiian word for "fast". "Wiki" has been backronymed by some to "What I Know Is". 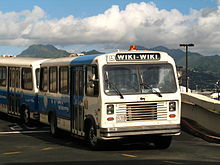 Wiki Wiki Shuttle at Honolulu International Airport. WikiWikiWeb was the first wiki. Ward Cunningham started developing WikiWikiWeb in 1994, and installed it on the Internet domain c2.com on 25 Maachị 1995. It was named by Cunningham, who remembered a Honolulu International Airport counter employee telling him to take the "Wiki Wiki" shuttle bus that runs between the airport's terminals. According to Cunningham, "I chose wiki-wiki as an alliterative substitute for 'quick' and thereby avoided naming this stuff quick-web." Cunningham was in part inspired by Apple's HyperCard. Apple had designed a system allowing users to create virtual "card stacks" supporting links among the various cards. Cunningham developed Vannevar Bush's ideas by allowing users to "comment on and change one another's text". Despite Cunningham's usage of the term, the origins of the name wiki in commerce can be traced to the first U.S. Trademark on the name "wiki", which was filed a year before Ward Cunningham started developing WikiWikiWeb in 1994 by a company called WikiDigs in Van Nuys, California on 12 Julaị 1993. The original trademark for "wiki" was used to describe a form of non-metal caps used for collecting and trading. However, the mark became abandoned by Disemba 1994 because of a failure to use the mark in commerce, opening the way to widespread adoption of the term in the computer industry. In the early 2000s, wikis were increasingly adopted in enterprise as collaborative software. Common uses included project communication, intranets, and documentation, initially for technical users. Today some companies use wikis as their only collaborative software and as a replacement for static intranets, and some schools and universities use wikis to enhance group learning. There may be greater use of wikis behind firewalls than on the public Internet. On 15 Maachị 2007, wiki entered the online Oxford English Dictionary. A wiki enables documents to be written collaboratively, in a simple markup language using a web browser. A single page in a wiki website is referred to as a "wiki page", while the entire collection of pages, which are usually well interconnected by hyperlinks, is "the wiki". A wiki is essentially a database for creating, browsing, and searching through information. A defining characteristic of wiki technology is the ease with which pages can be created and updated. Generally, there is no review before modifications are accepted. Many wikis are open to alteration by the general public without requiring them to register user accounts. Sometimes logging in for a session is recommended, to create a "wiki-signature" cookie for signing edits automatically. Many edits, however, can be made in real-time and appear almost instantly online. This can facilitate abuse of the system. Private wiki servers require user authentication to edit pages, and sometimes even to read them. Most wikis keep a record of changes made to wiki pages; often every version of the page is stored. This means that authors can revert to an older version of the page, should it be necessary because a mistake has been made or the page has been vandalized. 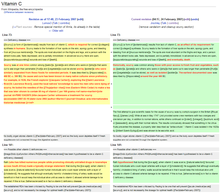 Many implementations (for example MediaWiki) allow users to supply an "edit summary" when they edit a page. This is a short piece of text (usually one line) summarizing the changes. It is not inserted into the article, but is stored along with that revision of the page, allowing users to explain what has been done and why; this is similar to a log message when committing changes to a revision control system. Within the text of most pages there are usually a large number of hypertext links to other pages. This form of non-linear navigation is more "native" to wiki than structured/formalized navigation schemes. That said, users can also create any number of index or table of contents pages, with hierarchical categorization or whatever form of organization they like. These may be challenging to maintain by hand, as multiple authors create and delete pages in an ad hoc manner. Wikis generally provide one or more ways to categorize or tag pages to support the maintenance of such index pages. Most wikis have a backlink feature, which displays all pages that link to a given page. It is typical in a wiki to create links to pages that do not yet exist, as a way to invite others to share what they know about a subject new to the wiki. Links are created using a specific syntax, the so-called "link pattern" (also see CURIE). Originally, most wikis used CamelCase to name pages and create links. These are produced by capitalizing words in a phrase and removing the spaces between them (the word "CamelCase" is itself an example). While CamelCase makes linking very easy, it also leads to links which are written in a form that deviates from the standard spelling. CamelCase-based wikis are instantly recognizable because they have many links with names such as "TableOfContents" and "BeginnerQuestions." It is possible for a wiki to render the visible anchor for such links "pretty" by reinserting spaces, and possibly also reverting to lower case. However, this reprocessing of the link to improve the readability of the anchor is limited by the loss of capitalization information caused by CamelCase reversal. For example, "RichardWagner" should be rendered as "Richard Wagner," whereas "PopularMusic" should be rendered as "popular music." There is no easy way to determine which capital letters should remain capitalized. As a result, many wikis now have "free linking" using brackets, and some disable CamelCase by default. Most wikis offer at least a title search, and sometimes a full-text search. The scalability of the search depends on whether the wiki engine uses a database. Indexed database access is necessary for high speed searches on large wikis. Alternatively, external search engines such as Google can sometimes be used on wikis with limited searching functions in order to obtain more precise results. However, a search engine's indexes can be very out of date (days, weeks or months) for many websites. Wiki software is a type of collaborative software that runs a wiki system, allowing web pages to be created and edited using a common web browser. It is usually implemented as an application server that runs on one or more web servers. The content is stored in a file system, and changes to the content are stored in a relational database management system. Alternatively, personal wikis run as a standalone application on a single computer. For example: WikidPad. The amount of vandalism a wiki receives depends on how open the wiki is. For instance, some wikis allow unregistered users, identified by their IP addresses, to edit content, whilst others limit this function to just registered users. Most wikis allow anonymous editing without an account, but give registered users additional editing functions; on most wikis, becoming a registered user is a short and simple process. Some wikis require an additional waiting period before gaining access to certain tools. For example, on the English Wikipedia, registered users can only rename pages if their account is at least four days old. Other wikis such as the Portuguese Wikipedia use an editing requirement instead of a time requirement, granting extra tools after the user has made a certain number of edits to prove their trustworthiness and usefulness as an editor. Basically, "closed up" wikis are more secure and reliable but grow slowly, whilst more open wikis grow at a steady rate but result in being an easy target for vandalism. A clear example of this would be that of Wikipedia and Citizendium. The first is extremely open, allowing anyone with a computer and internet access to edit it, making it grow rapidly, whilst the latter requires the users' real name and a biography of themselves, affecting the growth of the wiki but creating an almost "vandalism-free" ambiance. Many wiki communities are private, particularly within enterprises. They are often used as internal documentation for in-house systems and applications. There also exist WikiNodes which are pages on wikis that describe related wikis. They are usually organized as neighbors and delegates. A neighbor wiki is simply a wiki that may discuss similar content or may otherwise be of interest. A delegate wiki is a wiki that agrees to have certain content delegated to that wiki. One way of finding a wiki on a specific subject is to follow the wiki-node network from wiki to wiki; another is to take a Wiki "bus tour", for example: Àtụ:Srlink. Domain names containing "wiki" are growing in popularity to support specific niches. For those interested in creating their own wiki, there are publicly available "wiki farms", some of which can also make private, password-protected wikis. PBwiki, Socialtext, Wetpaint, and Wikia are popular examples of such services. For more information, see List of wiki farms. Note that free wiki farms generally contain advertising on every page. The English-language Wikipedia has the largest user base among wikis on the World Wide Web and ranks in the top 10 among all Web sites in terms of traffic. Other large wikis include the WikiWikiWeb, Memory Alpha, Wikivoyage, World66 and Susning.nu, a Swedish-language knowledge base. Wikimania, a conference dedicated to research and practice of Wikimedia Foundation projects like Wikipedia. There are also numerous small-scale educational communities using the Wiki software or variants. Wikidot's 'Philosophical Investigations' is one of the better known. In an Eprel 2009 article for the London Times Higher academic newspaper, the philosopher Martin Cohen predicted that this 'bottom-up' model would in due course supersede the ambitious "libraries of All Knowledge' like Wikipedia and Citizendium. List of learning resources – courses, instruction videos, slides, text books, quizzes, etc, related to Wikipedia and other Wikis. ↑ Cunningham, Ward (2002-06-27). What is a Wiki. WikiWikiWeb. Retrieved on 2008-04-10. ↑ Hawaiian Words; Hawaiian to English. Retrieved on 2008-09-19. ↑ The wiki principle. Retrieved on 2008-08-11. ↑ Cunningham, Ward (2003-11-01). Correspondence on the Etymology of Wiki. WikiWikiWeb. Retrieved on 2007-03-09. ↑ Cunningham, Ward (2008-02-25). Wiki History. WikiWikiWeb. Retrieved on 2007-03-09. ↑ Cunningham, Ward (2007-07-26). Wiki Wiki Hyper Card. WikiWikiWeb. Retrieved on 2007-03-09. ↑ Diamond, Graeme (2007-03-01). Maachị 2007 new words, OED. Oxford University Press. Retrieved on 2007-03-16. ↑ Soft Security. UseModWiki (2006-09-20). Retrieved on 2007-03-09. ↑ WikiStats by S23. S23Wiki (2008-04-03). Retrieved on 2007-04-07. ↑ Alexa Web Search – Top 500. Alexa Internet. Retrieved on 2008-04-15. Mader, Stewart (2007-12-10). Wikipatterns. John Wiley & Sons. ISBN 0470223626. Tapscott, Don (2008-04-17). Wikinomics: How Mass Collaboration Changes Everything. Portfolio Hardcover. ISBN 1591841933. Leuf, Bo (2001-04-13). The Wiki Way: Quick Collaboration on the Web. Addison-Wesley. ISBN 020171499X. Wikimedia Commons has media related to wiki. Exploring with Wiki An interview with Ward Cunningham, by Bill Verners. WikiMatrix website for comparing wikis.